I read the wikipedia passage on overlapping genes. The Tandem overlaps they speak of make sense to me, as I understand that their are different reading frames(3 in total if I understand correctly) for genes to be read in the 3' to 5' direction and that this causes an out of phase overlap. I am having trouble understanding the other scenarios spoken about in the passage, the in-phase tandem overlap and the Anti-parallel strand overlaps. Maybe I just lack a good enough background in genetics. I do not understand how you can have an in-phase tandem overlap. If the genes were in phase, how could they ever overlap and be different genes? 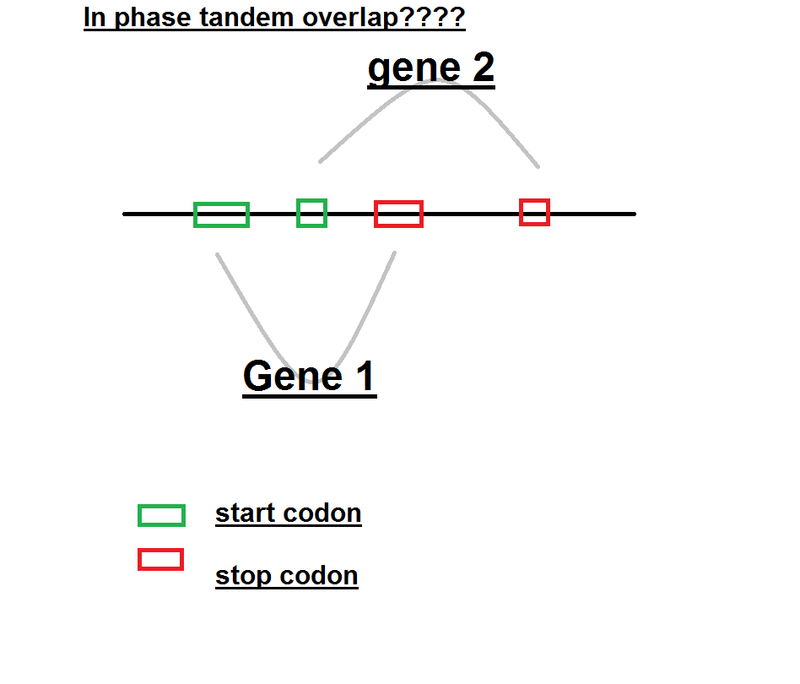 Wouldn't they both respectively have a stop codon, and then one stop codon would "stop" the translation? The anti-parallel strand overlaps also confuse me as well, for I do not understand how genes can overlap when on opposite strands. If the genes are on opposite strands wont that mean they wont have any overlap in the first place? Am I missing something basic? Thanks. A gene has got nothing to do with a stop codon. As you might know there are non-coding RNAs as well and the genomic regions responsible for transcription of these RNAs are also called genes. Genes that have an overlap in their genomic locations (without considering the strand orientation) are called overlapping genes. In case of same strand overlaps, the genes should have a different transcription start/stop site. Alternatively spliced RNAs are not considered overlapping transcripts. In certain cases, transcripts with an alternative transcription start/stop site are not considered separate genes but rather, isoforms, especially if the gene produces an mRNA and the alternate transcription start/stop sites just affect the untranslated regions (UTRs) and not the coding region (have a look at this article). Your confusion is quite valid and gene nomenclatures need some redefinition/clarification. SA = Start gene A.
SB = Start gene B. - = Non-coding or non-transcribed part of DNA. 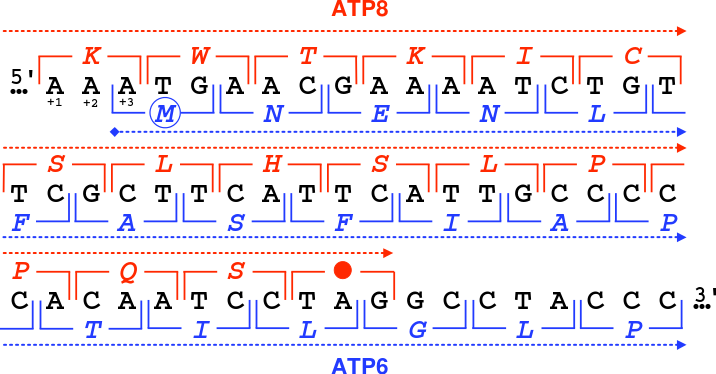 A = transcript region for gene A. B = transcript region for gene B. C = transcript region used by A and B. So in that example the primary transcript of gene A will consist of 13 regions. Gene B has 7 regions. They overlap in-frame in 3 regions (C). Where the first and last C regions are the start and end regions of gene A.